Hello again! Got myself another game in, this time against a new opponent with Lizardmen! Had a fantastic game, it swung back and forth very heavily, and was a lot of fun! I've never fought against Lizards before, only played them, and my opponent's list was fairly different to what I normally play with Lizards so it was an interesting match. My unconventional Elves were also a surprise for my opponent, so we both went in a bit blind. I'm still working on painting some of my newer models to modify my list and improve it, so I just went with one of my previous lists. Unfortunately I'm a bit low on pictures for this one, wasn't keeping track of them as well as I should have. There was a marsh in the middle of the table that would prove to be extremely important in the game and we decided to play as a mysterious marsh. Other than that the table had two forests and a bunch of fences, the terrain selection wasn't fantastic. 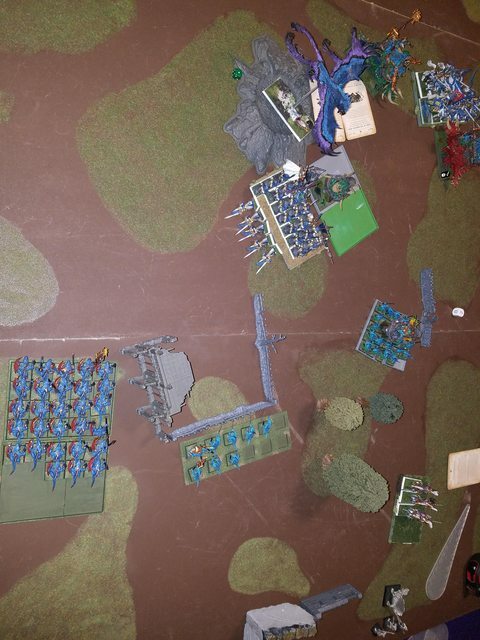 I decided to try to use that marsh as an anchor for my line, so my larger Spearmen block went down near it to hold the flank with the Swordmasters next to them to push the center. Across a few more fences the smaller Spearmen block would hold my right flank with the Reavers. 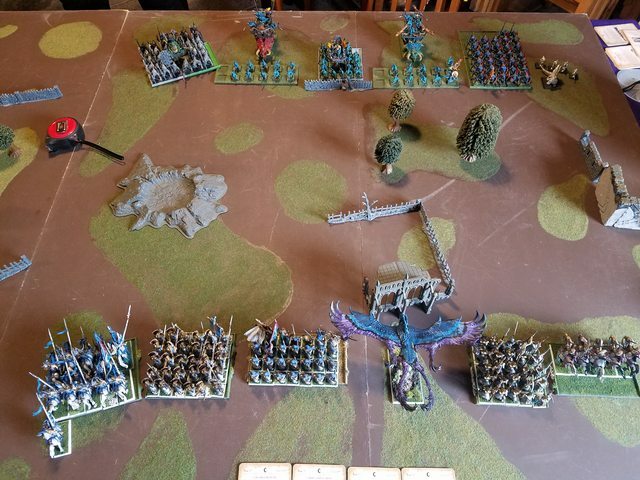 The Frostheart went down towards my right, trying to draw my opponent's forces that way so the Frosty could redeploy to my left where the Dragon Princes were and using my speed advantage I could flank left around the marsh and turn my opponent's flank. 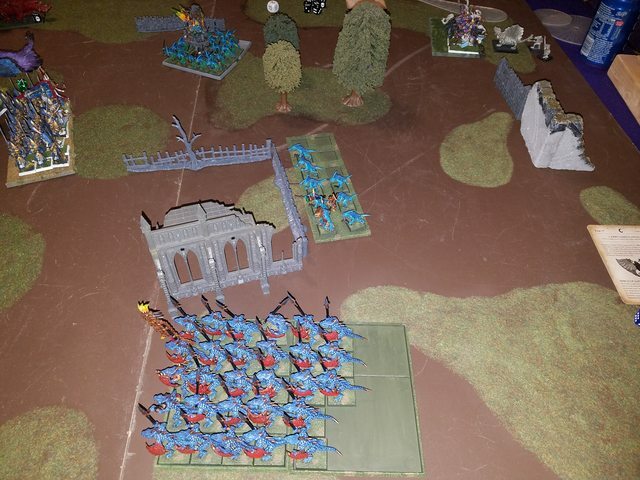 The Lizardmen line had the Temple Guard block with the Slann on their far right, which could cause me issue with my flanking move, and then the Skinks held the Lizardmen center with the Stegadons behind them. The Lizardmen left had the Salamander and the Saurus block. Tetto'Eko gave 2 units vanguard and my opponent decided to push the Temple Guard and Saurus into my face quickly. The Saurus advanced their full 12 preventing my Reavers from doing anything but shifting right a bit. The Temple Guard advanced towards the center very aggressively. The Temple Guard move worked perfectly into my plan. 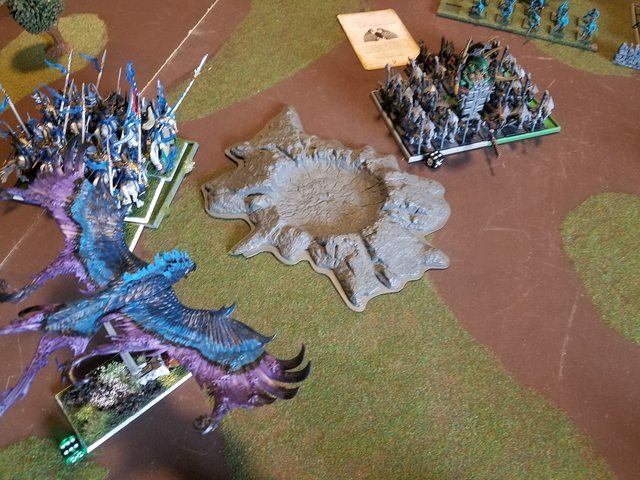 That pushed them towards the center, making it much easier for my Dragon Princes to circle around the flank and either charge their rear or bypass them, my concerns about a refused Lizardmen flank were gone. The Saurus on the other hand advanced far too quickly for my liking. 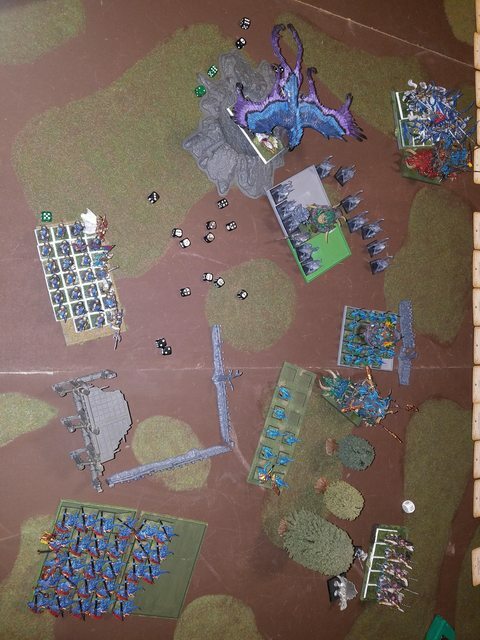 Instead of maybe being able to skirt around towards the center with my Spears and have the Reavers ward off the Saurus I now had to somehow prevent the Saurus from sweeping my flank and hitting the center hard. The new plan for the Reavers was to get in the back and kill that Salamander. The center shuffles forwards a bit hoping to draw the Temple Guard into a bad charge, the Frostheart flies over to get on the flank of the Temple Guard. The Dragon Princes march quickly around the marsh to begin turning the flank. On the side the Reavers marched quickly to get close to the Salamander and the Spearmen turned to face the Saurus, again hoping to draw them into a failed charge. Magic sees a 9-9 phase after the Slann channels 3 times. This would become a pattern. The magic phase is mostly shut down, through the Lizardmen scroll is drawn on Arcane Unforging towards the Slann. Convocation then miscasts onto the Temple Guard killing 6 of them, but my wizard loses a level and loses Convocation. Could have been worse, but could have been much better too. The Reavers manage to kill one of the Salamander handlers. It turns out the Temple Guard have the Skavenpelt and Jaguar banners! That meant that my 10" charges that were meant to be nearly impossible but to draw the Temple Guard forwards were suddenly very realistic. The Temple Guard declared a charge on the Spearmen, and I had to make an important choice. 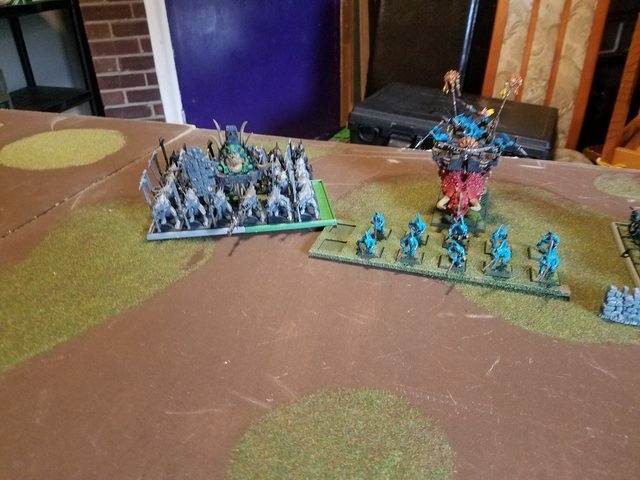 If they made it they would likely destroy the Spearmen and then they would be behind the flank of the Swordmasters and the Frostheart, meaning my counter-attack would be very difficult. So I decided to flee. As long as I rolled a 9 or lower on the flee they would stay on the table and could get back into the action. I rolled a 10. 300 points gone. The redirect into the Swordmasters then saw a charge of just 3", almost laughing at my fled Spearmen. This pushed the Temple guard onto the marsh, which we rolled as a Mist-Wreathed Swamp. This little piece of terrain is obscene, a unit that ends its movement must pass an initiative test or lose d6 models with no saves, basically a giant Purple Sun pit. Therefore, 6 Temple Guard are dragged to their deaths. The other Saurus declare a charge on the Spearmen, and successfully make their 9" charge, which was very much not according to plan. The magic phase is only 2 dice, and Iceshard Blizzard goes off onto the Frostheart. Convocation kills another 5 Temple Guard. The Salamander overshoots the Reavers. An Ancient Stegadon and Skink Skirmishers combine to kill 2 Dragon Princes after I fail 2/4 2+ saves. One Swordmaster falls to the other Ancient Stegadon. 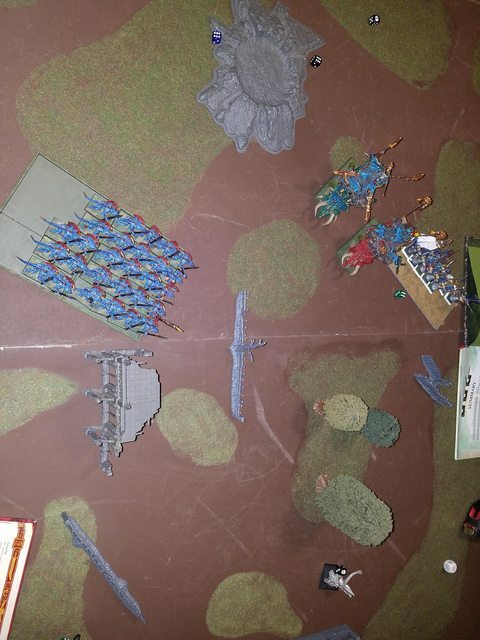 In combat the Spearmen kill 2 Saurus, and then the Saurus fluff their rolls badly and only kill 3 Spears, so they hold. The Dragon Princes charge the Skink Skirmishers to their front hoping to overrun into the Ancient Stegadon behind them. The Phoenix charges the Temple Guard in the flank, and then crucially the Swordmasters fail their 6" charge to get into the Temple Guard. At this moment, I realized the Phoenix had made a potentially catastrophic mistake, as it was now in the swamp. Since the Swamp rules say every unit must pass the test or lose d6 models, I realized the Phoenix would die if I failed an initiative test, and I'd have to take this test for every movement phase it was in that swamp, essentially as long as the combat with the Temple Guard lasted. Whoops. Magic has 3 Skinks die from Soul Quench and Drain Magic go off on the Frostheart. Convocation is dispelled. The Temple Guard lose 7 bodies to the Frostheart, but the Frostheart takes 2 wounds after some fantastic rolls from the 2 TG on the flank and 2 failed ward saves. The Spearmen kill 2 more Saurus but this time lose 9, break, and run off the table. The Saurus Warriors are now in my rear. The Dragon Princes kill the Skinks and overrun into the flank of the Ancient Stegadon. 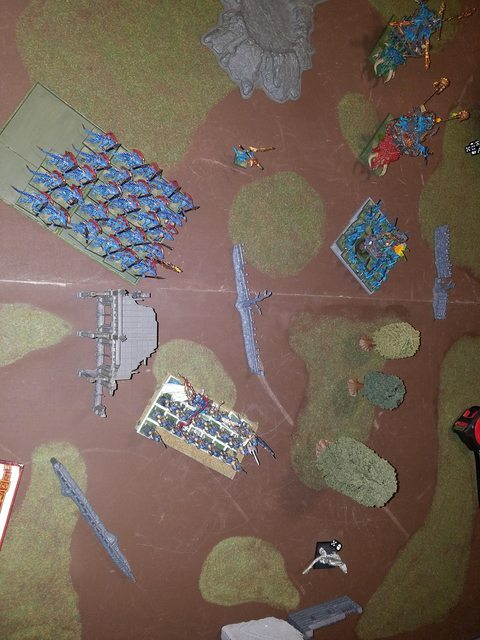 There is some general movement, the Saurus try to get relevant again by marching towards the Swordmasters rear, the Skink Skirmishers begin circling around, the Salamander continues his dance with the Reavers. Amazingly the Frostheart passes his second initiative test of the game to not die. The Salamander kills two of the Reavers, but they hold. Five of the Temple Guard are killed by the Frostheart, and they fail to wound the Frostheart, but the single Temple Guard holds with the Slann. Then, disaster strikes. The Noble puts 2 wounds on the Ancient Stegadon, but then 0/12 S5 hits manage to wound and the Stegadon kills 1 of the Princes. This will likely mean the end of the Dragon Princes. The Swordmasters charge the Temple Guard to finish them off and get the Slann. Amazingly the Frostheart passes his initiative test, but the Temple Guard do too. Then, of course, the Swordmasters fail theirs and 5 are killed. The Reavers manage to wound the Salamander twice and kill one more handler. The Slann is killed! The Frostheart reforms very awkwardly to get out of the swamp, and the Swordmasters turn to face Tetto'Eko's unit. The Dragon Princes again fail to produce a single wounding hit and 2 more are killed. The second Ancient Stegadon charges the Dragon Princes in the flank. Tetto'Eko's unit charges the Frostheart in the rear. At this point I have an important decision to make. 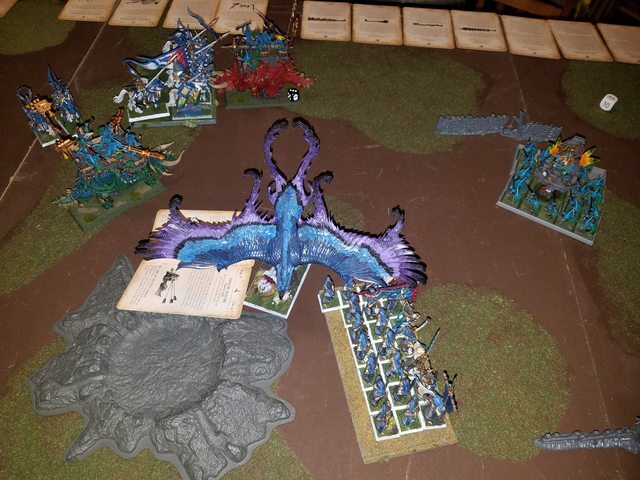 Odds aren't good that the Skinks will kill the Frostheart, but with just 1 wound left it is possible, and static res could give them the CC win regardless, and then they could run down the Phoenix. Worse still that would put Tetto'Eko's unit out of the charge arc of the Swordmasters. So I decided to flee. Unfortunately this put the Phoenix into the swamp again, and there's only so many initiative tests you can pass. He was killed by the swamp. 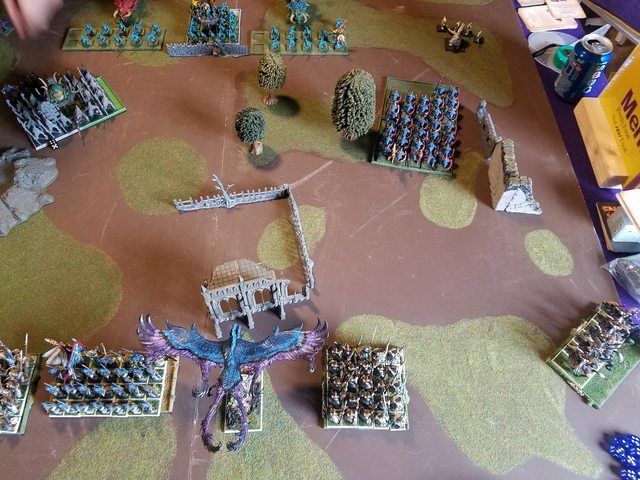 Tetto'Eko's unit is solidly exposing his flank to the Swordmasters, but Skink Skirmishers moved up to cover that and the Saurus Warriors moved around again to get a nice charge if possible next turn. Magic put Iceshard Blizzard on the doomed Dragon Princes. The Salamander misfires and eats his two remaining handlers. The Dragon Princes still cannot roll a 6 to save their lives, break, and are run down. One Stegadon restrained and turns to face the action. Very little left to do. The Swordmasters charge and annihilate the Skink Skirmishers to their front, then reform to take the charges from the Saurus Warriors and Stegadon incoming. In a critical moment of the game, I made a rules mistake. The Ancient Stegadon charged the Swordmasters, I elected to hold, but then rolled Terror, despite the Anointed making the unit Immune to Psychology. This was very possibly game-deciding, as they promptly failed their rerollable Ld 9 test and ran. This meant the Saurus Warriors could not charge, so they advanced to get in for the next turn and the other Stegadon returned to the action. Thunderbolt kills the last Reavers, and the Comet of Cassandora is dispelled. 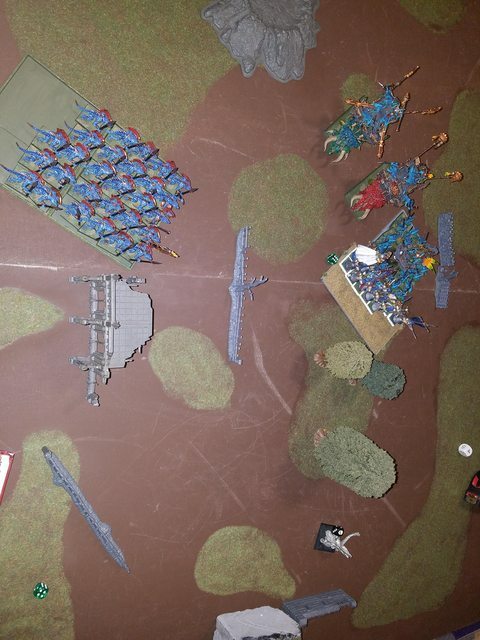 The Swordmasters rally, and Soul Quench kills off the Skink Priest that had left his unit. No charges interestingly. Instead, Curse of the Midnight Wind and Iceshard Blizzard are both cast on the Swordmasters. 9 Swordmasters then fall to the Salamander after only 2 5+ ward saves are passed. Another Swordmaster is killed by darts from a Stegadon. The Swordmasters charge Tetto'Eko's unit in a desperate attempt to score points. At this moment I figured I might be able to back up and keep the block alive, or charge. If I charged, the Swordmasters could possibly kill Tetto'Eko's unit, which might turn the game for me, but only if they can break steadfast, otherwise they will get hit by a Stegadon in the flank and be destroyed. Magic manages to cast Drain Magic on the Swordmasters to get rid of Curse and Blizzard. 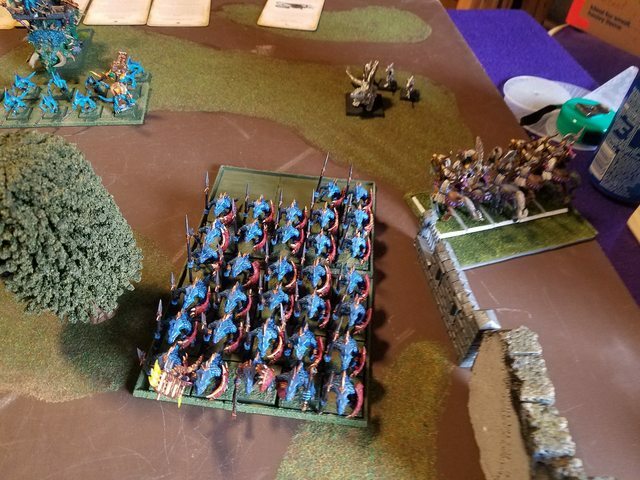 In a crucial combat the Swordmasters only kill 11 Skinks, and with only 5 Swordmasters in the second rank, a single dead Swordmaster means the Skinks are steadfast and will likely hold. But no! They survive! And the Skinks break from combat and are run down with a decisive 12" pursuit! With nobody able to charge the Stegadons turn to face the Swordmasters and a hail of darts kill 5 of them but the unit doesn't panic. 1659 - 1399 for a very minor High Elf victory! That was a close game! It swung back and forth quite a bit. Unfortunately my victory was heavily tainted by the Swordmaster flee, if they had not fled they would have taken the Saurus Warriors to the front and a Stegadon to the side, and though the unit is formidable I don't think they would have won that match-up, though it's impossible to be certain as there were still 19 Swordmasters and the two CC characters in the unit at the time. Leaving that mistake aside, the game I think had several crucial moments. Early on these moments all went in favor of my opponent and definitely removed the chance of a sweeping High Elf victory. The Dragon Princes utterly failing to kill the Ancient Stegadon was very sad, and my Caledorians disappointed me greatly. The Swordmasters failing their turn 2 charge was crucial as well, had they gotten in the Temple Guard very possibly would have been destroyed that turn, allowing for a dramatic overrun. The Spearmen running off the board on Turn 1 was also critical, taking out a combat block very early without them having done anything. Later in the game I got luckier, particularly that last turn charge against Tetto'Eko, as that decided the game in my favor and staved off a terrible High Elf defeat. 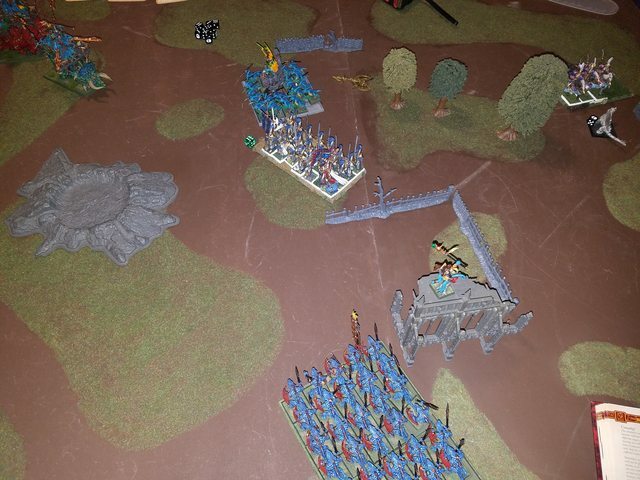 I think fleeing with the Spearmen turn 1 was likely not the right choice, even with swiftstride a 10" charge isn't that likely, and then the Temple Guard would have been very far from their supports allowing me to surround them even if they had made it. Fleeing with the Frostheart was also a poor move, as I should have realized what putting it in the swamp was likely to do. Tetto'Eko's unit would likely have failed to kill the Phoenix and at that point it would be a grind of a near-unkillable bird against some of the weakest CC troops in game. My move with the Dragon Princes I think was tactically sound, I just fluffed my rolls very badly, which cost me the unit. The Reavers also succeeded in keeping the Salamander occupied most of the game, which worked well. The Spearmen on the flank getting charged so quickly on Turn 1 was not ideal, I would have preferred Turn 2, but it still managed to keep those Saurus out of the rest of the game as the rest of my army was aggressively advancing in the other direction. My opponent's list I believe was too magic heavy. There was a fantastic magic selection, but just not enough opportunities to cast it. I was also surprised by the lack of any CC Lizardmen characters which could have been useful. Otherwise I though the list worked reasonably well. Vanguarding the large Saurus blocks was, however, in my opinion, a mistake. 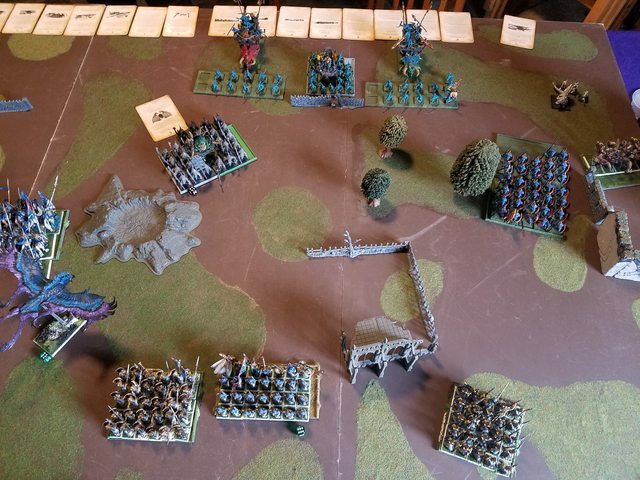 With two Skink Skirmisher units, two Ancient Stegadons, and all of that magical artillery the Lizardmen army could have played much more cautiously and forced me to attack and then whittled my units down from afar, considering that the current incarnation of my list has no shooting. Pushing the Temple Guard forwards in particular didn't work well because I had faster units that could outflank the Temple Guard and the Swordmaster block desperately wants to be in combat as soon as possible. Making me attack a refused-flank Lizardmen line would have been a much more difficult proposition for my army. Overall the game was great fun, and I hope to play again soon! Congrats on the (minor ) win. It reads like a very fun battle. I agree that vanguarding both large blocks was probably not a good idea by your opponent. He managed to divide his army in a way that normally takes an opponent a couple of turns of careful planning a baiting. It appeared like he felt he had to use the ability on his two strongest blocks because he had it, and not because he had a big tactical master plan. This let you grind down the Slann block without too much interference (which in the end played a big part in winning the game). And while the saurus block did take out the spearmen they didn't contribute all that much to the battle after that. A small rules thing, but I think the SM unit didn't need to pass the initiative test for the swamp (though it can be a bit hard to tell from the pictures). The rules mention that the majority of the units models need to be wholly in the swamp. And it looks like they are just barely touching it. As for fleeing, in my experience it's very rarely worth it, unless you have some plan with it in mind. It carries a lot of risk (you run off the table, can fail to rally, can get caught) and it takes a unit out of a battle for 2 turns at least (1 to rally, the second to actually get back to where it needs to be). It can also just postpone the inevitable, where you get charged again the next turn by the same unit, you're just in a worse position because you already fled for a turn. I think charging the DP into the stegadon solo might not have been the best idea. While 0/12 hits wounding is a bit extreme, I think 2 would be average. Also, 2 wounds from the Noble is probably slightly above average. Which means you'd always get stuck in for at least the second round of combat with just average rolling. And then you're whacking with S3 at a T6 monster (which can also be healed by the Slann). And any slightly below average rolling would stop the DP in their tracks and see them ground down and / or destroyed. Never a solid plan. I think aiming to double charge the Slann unit together with frosty would have given better results faster. I feel your opponent’s list was slightly stronger than yours. The Ancients are a problem for your Infantry and you lack the RBT to keep them (and the Skirmishers) under control. I feel your opponent’s magic should have hurt you more, that 2-dice phase and your IF’d Convocation restricted him there. I’d have been tempted again to have the Swordmasters leftmost of your Infantry as Spears just can’t cope. On the other hand we’re all in agreement that the Vanguards were a mistake. The Slann’s unit is strong but so are the Swordmasters and you have a Frostheart available. Instead I’d have pushed the Skirmishers to slow you down and waited for the Stegadons. I’d have considered sacrificing the Reavers to slow the Saurus down but that flank wasn’t a disaster. Drawing the Scroll Turn 1 was excellent. I feel the heavy losses of Temple Guard were a bit unlucky but that’s why they shouldn’t have advanced without support. That Frostheart charge did indeed look ambitious. The DP’s were a bit unlucky but that happens too often I feel. Killing the Slann was obviously huge. I agree you should have Held with the Frostheart, with BSB any Break test should be fine. Could Tetto’s unit have got away at the end or would the Swordmasters always have caught them on the charge? Thanks for another full report CR and well done grinding out the win! Haha, thanks! It was a fun game! Hmm, interesting. I read the rule differently, I thought that the majority of the unit being in the swamp was only for the hard cover bit and then you had to take the initiative test if you touched it at all. Fortunately, that mistake cost my opponent and myself pretty much equally, he lost a few TG and I lost a few Swordmasters. In hindsight it was definitely a mistake. I've found fleeing to sometimes help, such as when my cav is about to be flank charged or something like that, and particularly for redirectors it can work. I wasn't thinking of it postponing the inevitable, I was hoping that they would escape the Temple Guard and then the Swordmasters would charge them, I was not planning on the Spearmen seeing combat with the Temple Guard at all! But with them being that close to the board edge it would have been better for them to hold even if the TG made their charge, at least a few Saurus would die before the unit got mulched. The Stegadons were something I was a bit unsure of how to deal with. I figured Dragon Princes charging their flank was about my best option outside of the Swordmasters taking them head on, but the Swordmasters were engaged with the Temple Guard. As for charging the Temple Guard, I don't remember if a turn 2 charge was in their arc, I didn't actually check that, simply because if I didn't break them in a turn then the Stegadon would hit the Princes in the rear, and those Stegadons on the charge were a major concern of mine. The Ancient Stegadons were definitely an issue. I didn't have a great way of handling them, had it only been one I think I could have done much better. For the Swordmaster deployment I had put the Spearmen down before the Swordmasters, and I thought that the Temple Guard would be placed much more centrally, I wasn't expecting them to be relatively uncovered on the flank, so the Swordmasters were expecting the fight to be much more central. Haha, the Frostheart charge wasn't supposed to be! I figured with a Frostheart in the flank and Swordmasters to the front the Temple Guard would be pretty well handled. Then the Swordmasters failed their charge and things got a lot worse, especially with the Swamp being what it was. Tetto'Eko's unit could have fled, but it was an interesting decision. The charge wasn't that far, so a low flee roll and a high pursuit could have killed them. My opponent chose to stand and shoot to try and kill one Swordmaster, just killing one of them would have made it near impossible for me to break Steadfast at which point it would be very bad for me the next turn. Also, if he had fled I would have redirected to the Stegadon next to him, which was only on 3 wounds. At that point with my S7 Anointed and the rest of the unit being S5 I think I could have killed the Stegadon and escaped. The points change might have brought it closer to a draw, but I'm not sure it would have tipped it entirely. Thanks! I've got two games next week against Skaven and plan to write up both of those too. In one I'll be bringing Lizardmen, and I'll have High Elves for the other. The Ancient Stegadons were definitely an issue. I didn't have a great way of handling them, had it only been one I think I could have done much better. I agree, two was the issue. Sadly they are Stubborn and tough. The ability to put wounds on them at range (with shooting or magic) would have really helped because then you only need a couple of wounds on them in combat to go straight through them. An early drop that can work well for this kind of match-up is to put a Spear unit dead centre. Later, you deploy the Swordmasters and DP’s outside these, picking a flank once you know more. You can probably drop the Reavers and Phoenix early too as they’re easier to redeploy. First time I faced Tetto’s Vanguard tricks I was surprised by this too. An early TG push with an accompanying Stegadon could have been nasty. Still, it worked out OK in the end! Looking forward to these. Are you happier facing them with High Elves or with Lizards CR? Yeah, that weakness at range is something I'm working on fixing, but it's a slow process. I'm working on painting some new models that should help situations like this, though, so whenever they are finally finished my list should get a bit more versatile. I also would have liked either a Heavens or Metal mage in this list to help with ranged firepower, but I'm not quite sure where I'd add the mage in, because the Swordmasters need the High Mage quite a bit, so changing my magic would likely mean dropping the Swordmasters for something with a bit more solo-power like Phoenix Guard if I were to keep the list infantry focused. That's a very interesting idea. I always drop my Reavers first because they can redeploy quickly and putting them down tells my opponent very little about my battle plan. I usually put the two Spearmen units down next, for similar reasons, trying to keep my heavy hitters in the box as late as possible to respond to my opponent. I hadn't considered an early Phoenix drop, though, because I've always classified that has a heavy hitter that should be reserved, but of course with the fly speed it would be quite easy to put it somewhere to draw my opponents attention to that area then on turn 1 redeploy it. Putting the Spearmen in the center I've never really thought of. I usually try to use my Spearmen to cover the flanks of my Swordmasters in case my opponent out maneuvers me with speedy units, I don't want the Swordmasters getting stuck in a long flank grind, but putting the Spearmen centrally first would mean that it's more difficult for my opponent to predict where the Swordmasters will go and they can also still protect the flank to some extent. Most definitely High Elves! My Lizardmen army is based around a monster mash, and unfortunately while the models are fantastic and I love plopping 4+ giant dinosaurs on the table each game they don't do that well against massed infantry and the potential of cannons, and also the monster mash list is just a bit weak in 8th Edition typically anyways. 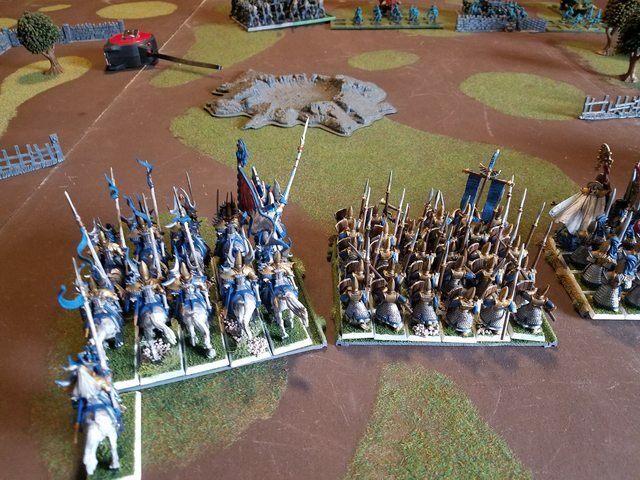 My High Elves, while they aren't all that competitive the way I play them right now either, are more suited for the match-up and are more competitive than my Lizards. I think my Lizardmen could be a lot more competitive if I added more Skinks to improve board control, and I'd also like to add Tetto'Eko to allow me to push Carnosaurs up the flank very quickly, but that means buying several new toys and then painting them all, and I'm currently trying to paint 11 Archers, 5 Dragon Princes, 12 Silver Helms, and a Star Dragon for an upcoming tournament, which is ambitious by my standards! So for a while at least my Lizardmen will be fun to bring out, but I think will not tend to perform that well. I guess you could try dropping the Anointed for more magic. TBH I found that Sword of Anti-heroes (with Merwyrm Shield and Ironcurse Icon) on the BSB got me by. Otherwise yeah, it’s probably RBT in or drop the Swordmasters. Putting the Spearmen in the center I've never really thought of. Deploying them centre-left or centre-right usually means they’re close enough to the action while still supporting a wider flank move by faster friends. I like the sound of this. Or Stegadons even? There are so many excellent tactical blogs deep in the archives here to go through! Stegadons could definitely work, but in the list I'm looking at right now Carnosaurs make more sense. Carnosaurs are faster and have Swiftstride making them a bit more suited to flank work, and Stegadons are excellent frontal threats with t6 and their impact hits. The Stegadons are the anvil, Carnosaurs the hammer. The idea is that the Skink cloud covers one flank, the Stegadons and the Saurus take up the center, and then the Carnosaurs advance up one flank. The Terradons can hunt warmachines, help cover the Carnosaur advance, or play chaff with the rest of the Skink cloud. The second Priest is a scroll caddy and is using Heavens because Iceshard Blizzard is a great spell and particularly good at shutting down warmachines which are a bit threat to the list. Tetto'Eko's Vanguard ability averages 2 units, so unless you're quite unlucky both Carnosaurs will get close to a free movement phase before the game to get into the enemy's flank. Tetto'Eko's Loremaster ability, his rerolling of 1's when casting, and the Engine of the Gods reducing Heavens casting values by 1 should make for a pretty powerful magic phase as well to help compensate for the lack of the usual level 4. I could see switching around some of the Oldblood's equipment to get him the OTS to improve the Carnosaur's hitting power, and with the increased points cost dropping the Terradons for another unit of Skirmishers. I can also see this list doing pretty well during the deployment phase because the Carnosaurs are the biggest heavy hitters that your opponent would want to avoid, but they drop last and since they operate mostly independently it would be really hard for your opponent to guess where they will go before you put them down. The center Saurus could probably be dropped early along with the Terradons, the Stegadon, the mage bunker, and most of the Skirmishers without giving any of the game away. Last edited by CaledorRises on Thu Feb 28, 2019 8:56 am, edited 1 time in total. Very interesting and I think it could work. I feel it needs a BSB though. Ah yes, that was a typo on my part, the Scar-Veteran on the Carnosaur is a BSB, just forgot to add it in. So long as the center pushes relatively aggressively and the Carnosaurs don't get delayed too long on the flank, combined with the 18" range, should mean that there's not a huge downside to having the BSB not with the army's center. should mean that there's not a huge downside to having the BSB not with the army's center. The main danger is the BSB getting taken off by war machines I suspect. On foot in the Saurus would be safer but that risks not supporting the flank attack enough. I guess you could run him on a Cold One with a Ward and Charmed Shield.